Welcome back to Survivor: Second Chance! 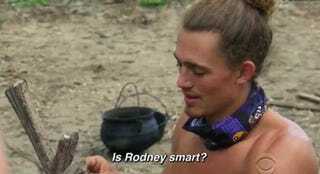 Tonight it seems like we are getting another tribe switch, someone is getting voted off, and someone else is going home. The promo for this week also featured Ciera and Jeremy choking down some gross bugs, so, yay! I always love this challenge (jkjk). So who do you think is going home, Clashtalk? Who do you want to get more screen time right now? Personally I think it’s a crime to have Joe on another season and not show his beautiful man bun(s) more.